Choose from either 1 hour or 2 hours rental. Price is per person. Minimum of two people required for safety. Kayaks used are double sea kayaks, unless odd numbers (single sit-top) Minimum age 8 years old. Exploring the beauty of the lake under your own power is a Queenstown experience that you will not want to miss. Travelling at your own pace with the sun glinting on the water and the breeze blowing gently on your face, our comfortable and stable sea kayaks will propel you across the magnificent waters of Lake Wakatipu. Our friendly team will kit you out with all the equipment you need before giving you a safety briefing and instructions on how to use the kayak. We will help you launch your kayak and be there to retrieve you on your return. A 1 hour shorter freedom rental is ideal for those with less experience kayaking but still want to discover the lakes hidden gems. Simply cruise and take in the amazing sights and sounds that are on offer or take it up a gear for invigorating outdoor fitness. If you have extra time take a kayak for 2 hours it will be an unforgettable paddle surrounded by breath taking scenery. **3 hour kayak rentals are available but are subject to weather forecasts and conditions on the day. $79 per person paid on the day, either cash or credit card. A cellphone (essential) - We need you to take a working cellphone for communication. Trips are suitable for experienced or first time kayakers, area might be limited in certain weather conditions. Guided Kayak Tour - 3-3.5hr. 1:8 max ratio. Tea/ Coffee refreshments. Excellent quality kayak equipment. Minimum age 8. Max Weight 120kg. Start your day up close and personal in New Zealand’s incredible landscape by taking to the waters of Lake Wakatipu on our informative and interactive guided kayak tour. Experience the enormity of the mountains at water level and immerse yourself in the tranquility of this unbelievable lake. This guided tour is suited to both experienced or first-time kayakers. Our friendly and experienced guides will give you all the equipment and instruction you need. You will be paddling in the most comfortable sea kayaks around, designed to have good stability and speed. Once out on the calm waters, your guide will lead you safely along the edge of the lake towards the beautiful Sunshine Bay. Encounter the native wildlife and hidden beaches that make this part of the lake so unique. As you paddle listen to the history, facts and legends that make this part of the world so fascinating. During your trip you will get the chance to come ashore one of the secluded beaches, stretch your legs and enjoy some refreshments provided to you by your guide. From here you will paddle back to the starting point with a camera full of exceptional photographs. Take a trip with us to take in the sights and sounds of one of the most awe – inspiring places on Earth! Guided Kayak Tour - 3-3.5hr 1:8 max ratio Tea/ Coffee refreshments Excellent quality Kayak equipment. Minimum age 8. Max Weight 120kg. Take the journey into the Queenstown back country with our half day guided tour to stunning Moke Lake. Located just 20 minutes from Queenstown this quiet and peaceful setting allows you to escape the hustle and bustle of town and immerse yourself in a beautiful rural New Zealand environment surrounded by mountains. Choose from either 1 hour or 2 hours rental. Price is per person. Minimum of two people required for safety. We have a range of Red Paddle Co boards to choose from 10'6 right through to 13'2 Minimum age 8 years old. Exploring the beauty of the lake under your own power is a Queenstown experience that you will not want to miss. Travelling at your own pace with the sun glinting on the water and the breeze blowing gently on your face, our top of the line Red Paddle Co SUP boards are an excellent way to see the magnificent waters of Lake Wakatipu. Our friendly team will kit you out with all the equipment you need before giving you a safety briefing and instructions on how to use the paddle board. We will help you launch your kayak and be there to retrieve you on your return. A 1 hour shorter freedom rental is ideal for those with less experience on a SUP but still want to discover the lakes hidden gems. Simply cruise and take in the amazing sights and sounds that are on offer or take it up a gear for invigorating outdoor fitness. If you have extra time take a SUP for 2 hours it will be an unforgettable paddle surrounded by breath taking scenery. **3 hour SUP rentals are available but are subject to weather forecasts and conditions on the day. $79 per person paid on the day, either cash or credit card. Trips are suitable for experienced or first time paddlers, area might be limited in certain weather conditions. Private 3 Hour Guided Kayak Tour, have your own guide take you where you want to go. 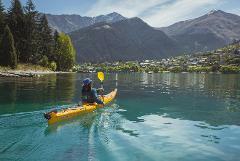 Enjoy the very best of kayaking in Queenstown. Our senior guide will meet you at your accommodation and transport you to one of many starting points for a kayak adventure based on weather conditions.